This is now Tuesday 26th May and Jacqueline was on breakfast duty and Jim and Iain set off to collect Nicola from the Airport at approximately 9 am. Once Nicola, Jim and Iain returned from the airport, we quickly got Nicola settled in to her room and we all sat down to a good old traditional fry up. 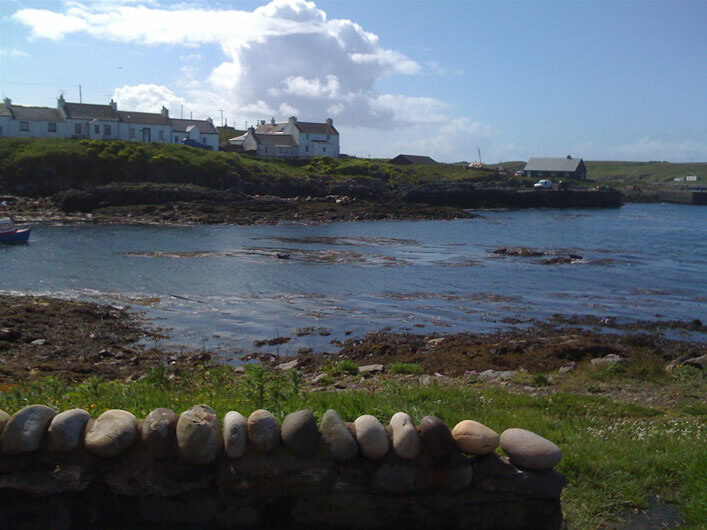 Once all cleared away it was agreed that we would all drive down to Portnahaven and Port Wemyss a new experience for Nicola. Jacqueline was very keen to let Nicola see her favourite spot on the globe (simple I know, but it is a bench that sits on the corner of a cliff edge and you can just watch the waves crash agains the rocks. For all the right reasons, this is the one place that Jacqueline feels completely at peace, breathing in the fresh Atlantic air). Prior to leaving this beautiful part of the Island, we drove around the Portnahaven bay where Nicola took photographs of the sunbathing seals. Our intention today was to go to the Laphroaig Distillery open day, but on route we called in to our new best friends at Bruichladdich. 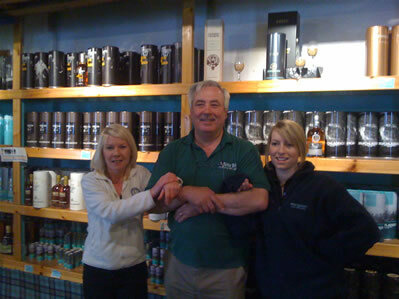 The distillery shop was much quieter than on our last visit, so we had a really good opportunity to chat to the staff. We passed on our business cards and discussed our website explaining the premise that it was originally set up by two guys who are neighbours who really enjoy their Whisky and they provide their opinions, views and preferences in an objective and entertaining way (the guys would be unable to provide all this information, if it was not for the third Whisky Boy Nicola (who is actually a girl) who is a web designer by profession and looks after all the technical “stuff”. Again it must be said that the shop girls were very knowledgeable, helpful and enthusiastic about their products and the Whisky Boys enjoyed a couple of impromptu tastings that the girls provided. Prior to leaving we all booked onto the 10.00 tour of the distillery on Wednesday. We all agreed that this was a really enjoyable, pleasant hour or so we spent chatting and having a laugh with these ladies. 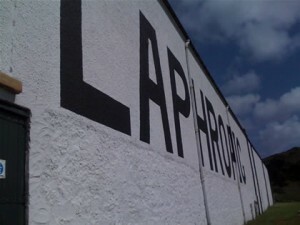 So off we headed to our ultimate destination Laphroaig Distillery. As both Jim, Iain and Nicola are Friends of Laphroaig they all collected their rent in the form of a miniature of Laphroaig 10 year old single malt. This is a very good idea, as it allows any drivers to enjoy the dram when they get home. On getting out of the car, the air was filled with the aroma of burning peat which completely enhanced this romantic setting. We headed down to the visitor centre where there was a real buzz enhanced by the sound of traditional Scottish music being played on the accordion and fiddle. Between the scent and the sound it was impossible to not tap your toes and smile. We proceed through to the new Friends of Laphroaig lounge, superb. Then onto the new Laphroaig museum where Jacqueline was glad to see a picture of her ultimate hero – the one and only Sean Connery (what a man !!!). We all enjoyed wondering around the museum and found it very informative. 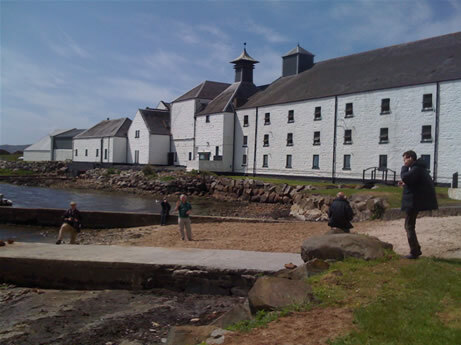 There were various tours going on and some people were donning the wellies and going off to put a flag in their “square foot” of Islay soil, some were just sitting outside in the sun sipping a dram soaking in the wonderful atmosphere of peat, Whisky and music. Well done Laphroaig a good open day, plenty of visitors, great atmosphere, fabulous music and not a tea and coffee van in site. 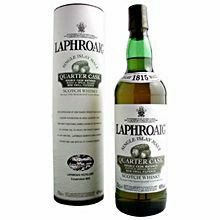 Jim could not resist and had to purchase a bottle of Quarter Cask. So our next experience was to try and get Internet connection for Nicola, plus the group also felt in need of a little sustenance and wee dram. Jacqueline decided that she would do the rest of the days driving to allow the others to enjoy a drink safely. We set off to the Lochside Hotel in Shore Street in Bowmore. That was an experience. The drinks were ordered and Jacqueline requested a coffee and a scone, as there was sign indicating that food would be served all day. The table we sat at was about 2 metres from where most people were enjoying a late lunch. The drinks arrived, with crisps and nuts, but the bar man told Jim that if Jacqueline was to eat her scone with her coffee she would need to move over to the restaurant section. Obviously our table was a NO SCONE AREA. We all thought this was really ridiculous and had a good laugh, but the situation was compounded when Jacqueline requested shortbread from the waiter rather than a scone, and this was permissible. We should really try to get a copy of the recipe for these dangerous scones. The barma n, also refused divulge the password for Nicola to use the WIFE connection as it was only for residents. All be it we were spending a few pounds on drinks, they would still not give us the password, but through the Whisky Boys cunning means we discovered what it is and if anyone pops into the Loch Side Hotel and wants to use their WIFI the password is MOONSHINE if anyone asks, tell them the Whisky Boys told you. Also if you visit – you must check out the scone situation. Please let us know if you have ever encountered a similar scone situation. After returning home, we popped out to the Lochindaal Bar where a few games of pool were played, a couple of beers drunk and a few drams were consumed. The barman was very entertaining, and kept us in knots. Again if you ever visit this bar you must check out the Juke Box – it has some really strange music on it, but again it is eccentric but fun. After a home made dinner and a bottle good wine we settled down to watch Britain has got talent then off to bed. Night Night tomorrow we will be scouring the Island to see if there is more scone action out there. Let me know which are the most dangerous – scones or shortbread.